Vegetarian Light | Light Living. Light Eating. Today is the first official day of my clean eating challenge. For breakfast I had oatmeal and strawberries. I cheated at lunch because I was gone for the day unexpectedly and I packed a pbj on wheat at the last minute, which I ate in the car. But I was back on track at supper. I made a simple supper of Farro with green chard and toasted walnuts. I used a quicker cooking Farro and it was ready in about 20 minutes. It sounds plain, but was actually very tasty. Although it would have been better with the homemade bread I haven’t made yet. 3) In a large skillet or pan, add the walnuts and toast on medium-high heat for about 5 minutes, stirring a few times. Remove. 4) Using the same pan you used for the walnuts, add a couple tbsp. of olive oil, and the stems of the green chard, chopped. Saute about 5 minutes on medium-high heat. Then add the rest of the greens, roughly chopped. Add the remaining broth or water. Add the crushed red pepper. Reduce heat and simmer for about another 10 minutes. 5) Serve the greens over the farro. Top with the walnuts. A friend recently told me she is going to take some time to eat foods that are both clean and vegan. She said she has done this before and ended up feeling fabulous. I’ve decided to accept the clean eating challenge for 10 days, beginning this Thursday, April 13. Today I ventured to Whole Foods and stocked up on lentils, greens, grains, walnuts, berries and other staples that will help me to cook vegan, clean food that is also yummy. I also bought some organic flour and yeast, because I’m going to be making bread. In case you’re unfamiliar with what clean eating is, it basically means you avoid processed foods and eat whole foods. I’m vegetarian, not 100% vegan, so I’ll also be adding the vegan component to my challenge. Join me in the 10-day vegan, clean-eating challenge! * I will take a break from the challenge Easter Sunday, but be back at it the following Monday. I spent a semester in Spain in college. On special occasions, families and friends would gather around large pans of paella cooking over an outdoor flame, similar to the way Americans get together to cook hotdogs and hamburgers on the grill. The Spanish versions of paella always started with rice, but often included a variety of shell fish and chicken. My version is vegan, and I also give the option to use orzo, which is a rice-shaped pasta, instead of rice. A large pan of paella is the perfect dish for Easter dinner! Mix together seitan marinade. Pour over seitan and let sit about 30 minutes. Saute onion and red pepper in olive oil on medium heat until softened. Add in the garlic and saute a minute more. Add remaining ingredients and spices, except orzo and seitan. Stir together. Bring to a quick boil, then immediately reduce to a simmer. Simmer about 20 minutes. While dish is simmering, cook orzo or rice. Stir the marinated seitan in with the veggie mixture. Simmer about another 10 minutes. Serve over orzo or rice. Even though it’s October, farmer’s markets are still displaying this season’s fresh tomatoes, although the supply is dwindling. Don’t let the opportunity to cook with these jewels slip through your fingers. The vegetable stand near me also has green tomatoes still available. 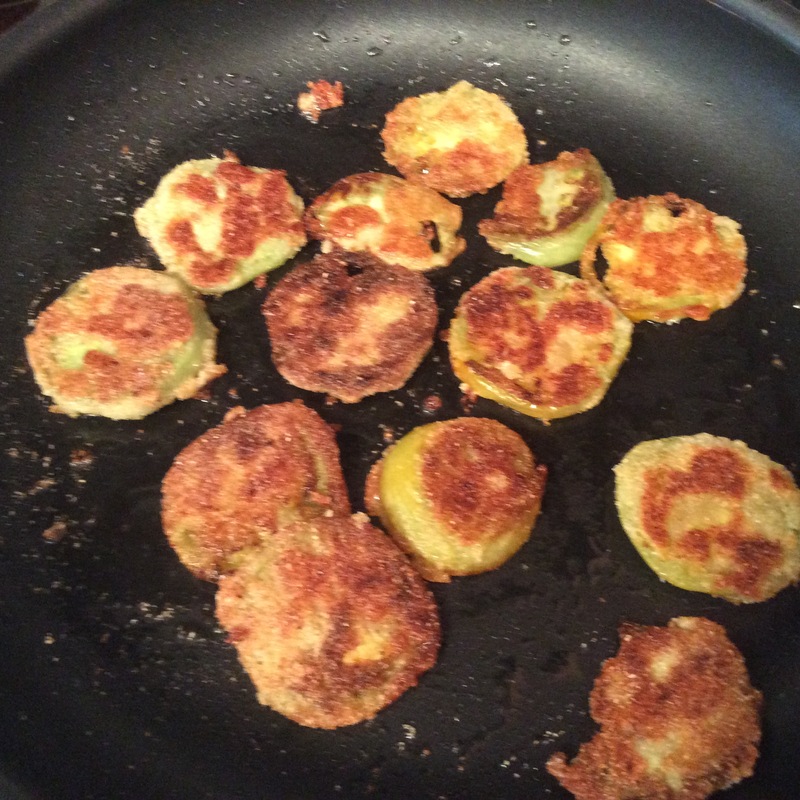 Not sure if you can find these in your neck of the woods, but if so, you might want to try this recipe for perfectly crispy fried green tomatoes. Start with a medium-sized green tomato. 1) Slice relatively thin (thick slices don’t get crispy enough). 3) Dip in flour (both sides). 4) Dip in water again. 5) Dip in corn meal (both sides) (double dipping helps to keep the crust on the tomatoes for some reason). 6) Fry in hot canola oil in a large fry pan (preheat oil before adding tomato slices). Oil should just slightly cover the entire pan but not be too deep. 7) Flip after a couple of minutes. Should be crispy on each side but not burned. 8) Remove to plate covered with a paper towel to absorb any excess oil. Delicious as a side dish or appetizer. One medium tomato makes about 8 slices. Note – I decided the quest to make a dish from each state in the U.S. was not a quest I wanted to undertake at this time after all. I have a friend from Arkansas and she told me they eat a lot of fried foods there. When I researched the native foods, I found that soybeans are a big crop. It seemed logical then to feature fried tofu as a featured recipe from Arkansas. 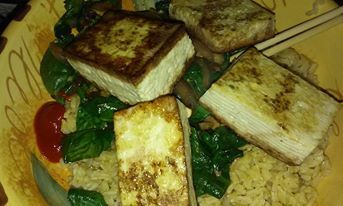 Fried tofu is delicious, high in protein and can be served with stir fries or as the main course with other veggies or rice. 1) Take tofu from package and pat dry with paper towels. Continue patting dry until paper towels are no longer absorbing water from the tofu. You may need to leave the tofu, wrapped in paper towels for up to 30 minutes and come back to it. 2) Divide the tofu into eight pieces, about 1 1/2 inches thick. 3) Heat oil in large frying pan to medium-high. If you plan to use it in an Asian recipe, add the soy sauce. Add the tofu slices and fry for about 5 minute on each side. Remove to plate lined with paper towel to absorb any oil. Serve as desired. 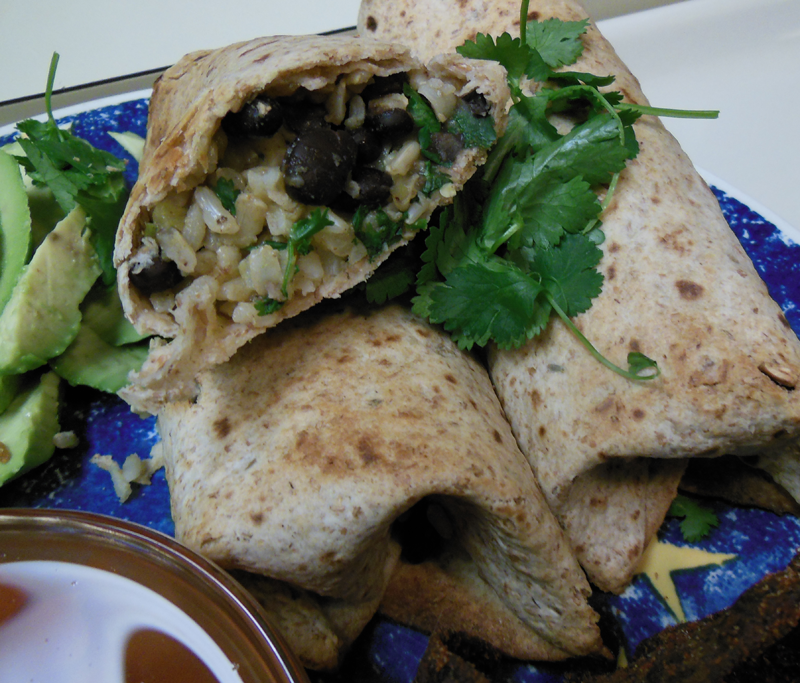 * This is week 5 of my “quest” to make a vegan recipe from every state in the U.S. during 2015. Note – I decided the quest to make a dish from every state in the U.S. was not one I wanted to take on at that time! 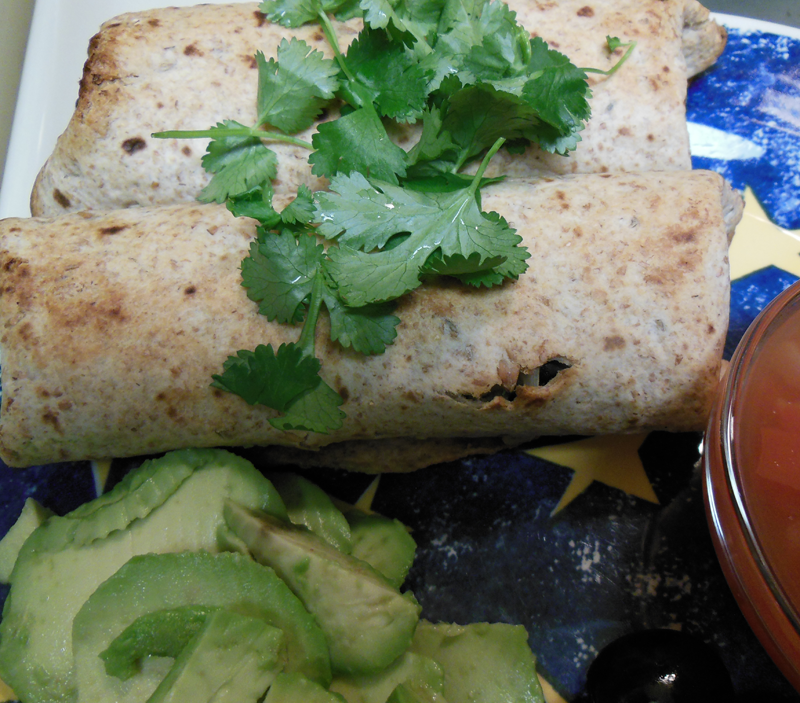 I had never made chimichangas before but I liked the sound of them: yummy rice, beans, corn rolled up into a crispy tortilla and served with guacamole and salsa. They are not hard to make. This version is vegan and because they are baked in a hot oven instead of fried in oil, they have less fat. Even though baked, not fried, they still turned out crispy and delicious. Mix together all ingredients except tortillas. Scoop about 2/3 cup of filling into the first tortilla. Fold the ends over and roll up the tortilla. Repeat with remaining tortillas. Place chimichangas on the cookie sheet, seam side down. Brush with olive oil. Bake at 450 degrees for 5 minutes. Remove from oven, turn tortillas over and brush other side with olive oil. Return to oven for another 5 minutes. Should be crispy and light brown. Serves 2 to 3 people, depending on appetites. * This is week 4 of my “quest” to make a vegan recipe from every state in the U.S. during 2015. What type of foods do they eat in Alaska? I would guess they eat a lot of hot soup because it’s cold. 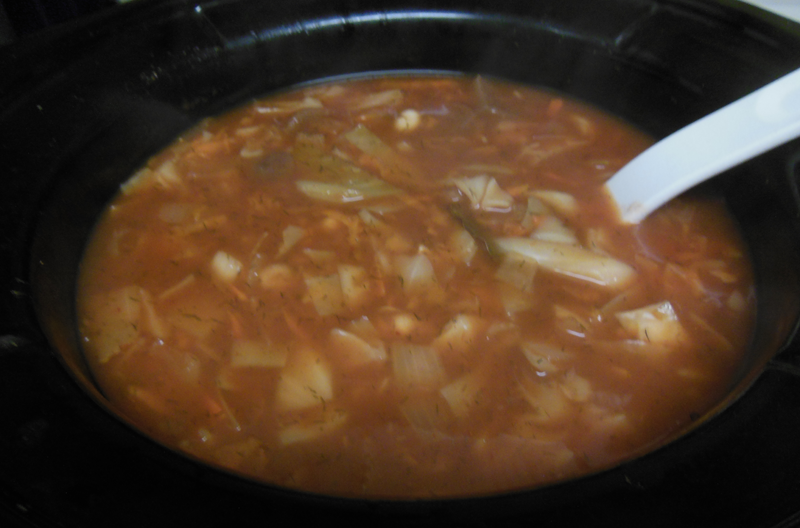 When I researched info about Alaskan cuisine online, Borscht came up several times. Makes sense because Alaska is only separated from Russia by a narrow body of water, and Russians and East Europeans, including the Polish, favor this dish. Borscht is a hearty, nourishing hot soup. It contains a powerhouse of healthy ingredients. I found several recipes online and created a version for the crock pot. It turned out great. 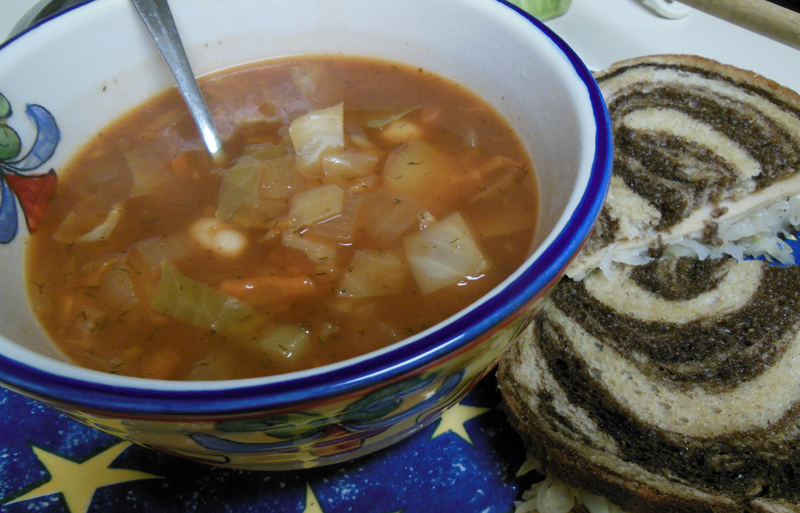 I highly recommend this savory soup for a cold winter evening. Place all ingredients except canned beans and beets into crock pot. Stir to mix them together. Set to low heat and cover. Crock for about 5-6 hours. About 20 minutes before serving, add the white beans and beets. Serve. Delicious with a veggie Reuben sandwich! Makes enough soup for about six or seven people. * This is week 3 of my “quest” to make a vegan recipe from every state in the U.S. during 2015. Since there are 50 states and 52 weeks, the first week is a Native American recipe and the last week will be a holiday recipe. Inspiration for my quest came from Chris Guillebeau and his recent book The Happiness of Pursuit. Check them out!